For some women, shoe shopping is a sport. It is approached with the same enthusiasm as hunting. As they track down fashionable shoes which express their personality, it's exciting. If they find them at a great price, it's exhilarating. I am speaking of healthy women who can wear stilettos or any other great-looking, outrageous shoe that would be described as "bad for your feet". A lot of women with arthritis can't join in the fun, but that doesn't mean they don't appreciate a good shoe. It's just that their idea of a "good shoe" is one that doesn't hurt their feet. It's all about comfort. At one time, "comfort" was synonymous with "ugly". Not so much anymore. The market for comfortable shoes has expanded and there does seem to be more selection. Even so, it's hard to find a comfortable shoe that excites you. I have bought many shoes that "looked" like they would be comfortable. They had the qualities a comfortable shoe should have -- a wide toe box, cushioning, arch support, and a flat, flexible sole. I have bought shoes after trying them on in the store, as well as by taking my chances with an online purchase. Too often, the end result was disappointment. If I got lucky, I ended up with a pair of shoes that was adequate, but never anything to shout about. Until now. Believe it or not, I didn't intend to write a shoe review. But, the Skechers Go Walk shoes that I ordered online are deserving of this review. I gambled yet again and hoped that they would be as great as they appeared to be online. I have said and done the same thing so many times before. 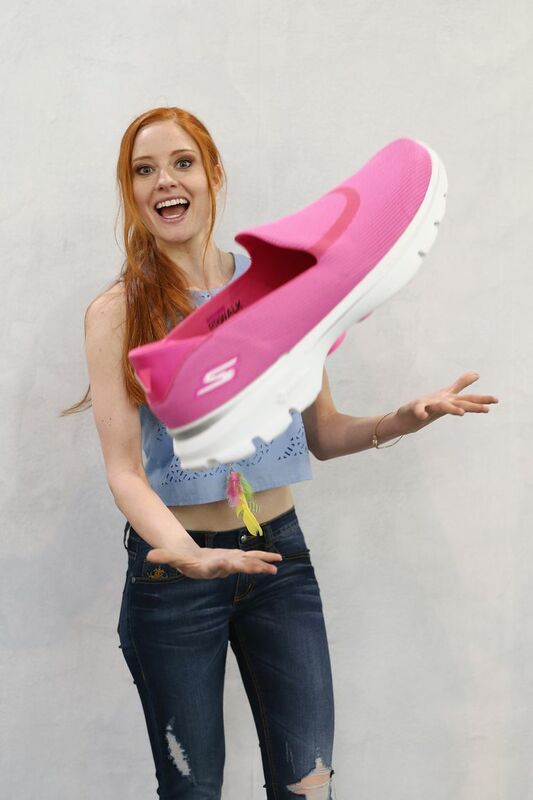 But, there is something unique and different about Skechers Go Walk shoes. They are everything they claim to be and more. Skechers Go Walk shoes come in a slip-on style. When I first took them out of the box, I was shocked at how lightweight they are -- truly featherweight. If you have arthritis in your hips, knees, ankles, or feet, heavy or clunky shoes are cumbersome and painful. When I found them to be lightweight, I thought I was going to like the shoes, but I had no idea just how much I would like them. The shoes have a wide, rounded toe box. It is extremely accommodating, even for those who have hammertoes or other foot deformities. The fabric (upper) is soft, as is the antimicrobial lining. The fabric seems to soothe the foot. The padded footbed is simply amazing. It has a generous amount of cushioning and provides arch support, too. The outsole is made of a material called Resalyte. There are "GOimpulse sensors" that, according to Skechers, "move together and independently as they provide sensory feedback to the brain to promote a more natural stride". While I'm not sure of the science behind that claim, the outsole is flexible in a way that truly does seem to improve your stride. I have seen other glowing customer reviews for Skechers Go Walk shoes online. One person described them "as comfortable as bedroom slippers". Another said the shoes feel "like you are wearing nothing at all on your feet". I can tell you that the first day I had them, I wore them for 9 hours straight. There was no break-in period needed. Every day since, I have worn my Skechers Go Walk shoes. The shoes encourage me to walk more. They are that comfortable. They actually make your feet feel better. They do not pinch or rub on any area of my foot. There is no soreness caused by the shoes, even after hours of wear. I typically wear an 8 1/2 or 9 Medium, depending on the shoe. I went with a 9 when I placed my order and it worked out well. They also come in a wide width for those who need it. Skechers Go Walk shoes come in neutral colors and bright, lively colors. Bottom line -- I don't remember the last time I had a pair of shoes that I loved. These are not to be missed! I went back and ordered more. Note: Since this review was originally written, Skechers has designed and marketed newer versions of the original Go Walk shoe, called the Go Walk 2 and Go Walk 3. The basic design is the same and the features we love are still included. There is more padding, including memory foam, in the newer versions. Most people will view that as an improvement. The extra padding may be a problem for some people who wear orthotic insoles, because the orthotic would sit on the existing insole that is not removeable. You will simply need to try. Can a Sock Aid Really Help People Who Have Arthritis?